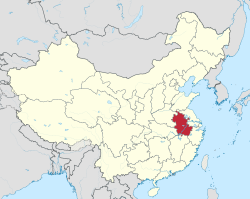 Anhui (安徽; Ān​huī​) is a province in the south central region of China. Anhui Province located in the east of China, less than 3 hours from Shanghai by high-speed train. With Yangtze River and Huaihe River cross through from south and north of the province, it is divided into three parts: South Anhui, Middle Anhui, and North Anhui. Its typical semitropical climate makes it a place with distinct four seasons. This page was last edited on 9 October 2016, at 10:44.